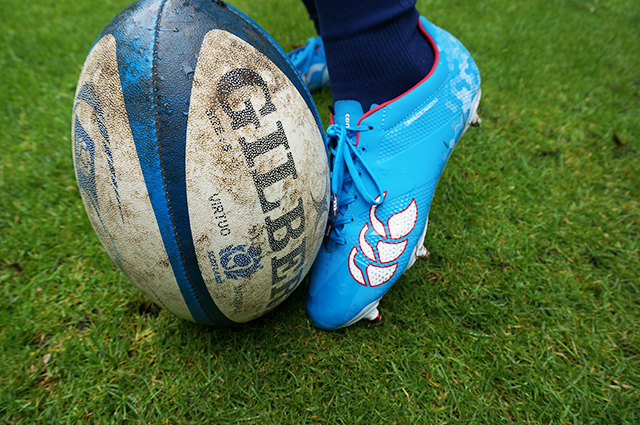 We gave a pair of each boots to two seasoned rugby players, let them fight over which pair they would wear and sent them to a couple of tough, pre-season training sessions to test them out. 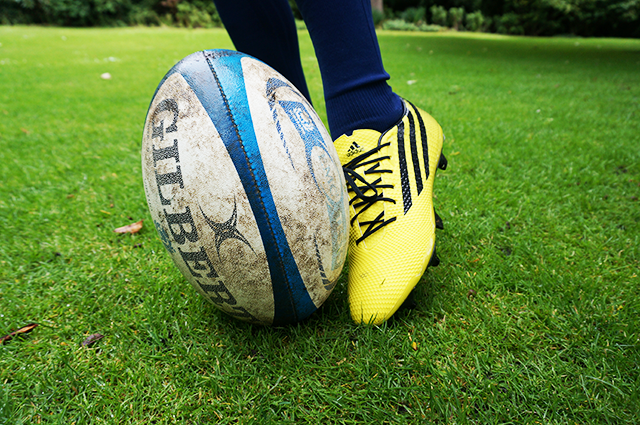 We’ll give you a brief background of the testers to set the scene and then dive into their reviews of the Canterbury Speed Elite and adidas Crazyquick Malice rugby boots. Having grown up in Queensland, Australia, I’m from a league background but have enjoyed keeping up with the rugby union world throughout my life as well. 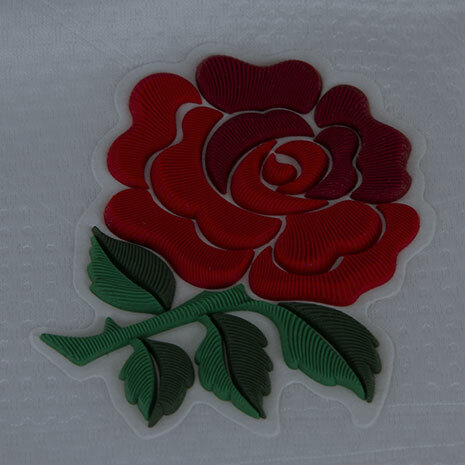 I’m quite a versatile player, having spent time in the halves, back row and outside backs. I take my physical fitness seriously and love seeing my hard work at the gym pay off on the field. I have played rugby at a variety of levels over the past 15 years. I’m currently playing as an inside centre for Leith Academicals in Edinburgh but have played all across the back line. I fear it may be a sign that my faster days are behind me that I now find myself at inside centre, but the jury’s still out on that one. The Canterbury Speed Elite are constructed with a comfortable synthetic leather upper and thermoplastic polyurethane (TPU) through the internal frame. Using TPU makes the boots super lightweight, offers the wearer additional abrasion resistance and provides a flexible feel through the forefoot. The combination of the durable synthetic outer and the high-tech TPU frame makes for a very quick pair of boots that won’t fall to pieces anytime soon. Additionally, I can truly vouch for the flexible forefoot allowed by the TPU which gives the feeling that you’ve been wearing the boots a lot longer than a couple of sessions. I personally prefer rugby boots with more studs that offer better weight distribution across the sole. Obviously, the importance of this characteristic will depend on personal preference and situational needs. Technologically speaking, these boots are more than sound. 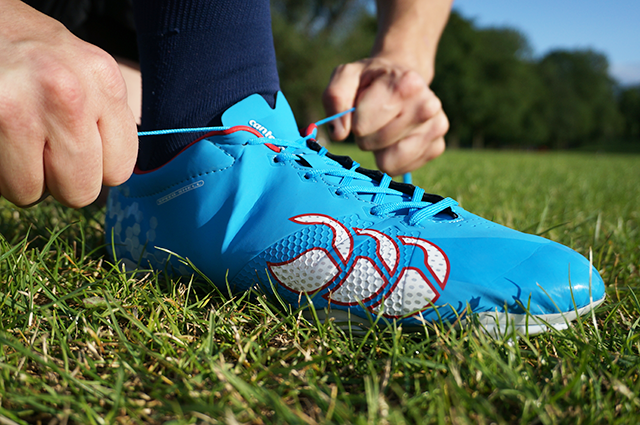 The synthetic upper offers support in key areas but remains lightweight across the whole boot. Slightly raised heels have been implemented to offer a dynamic foot position. This may seem like a minimal inclusion but you can really feel the difference – it’s like wearing a sports shoe as you feel you have more support at the back of your foot. 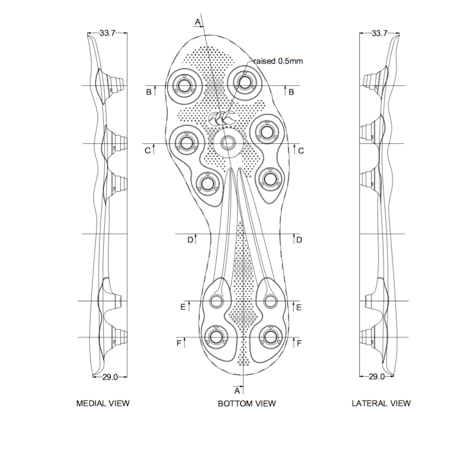 The Speed Traxion stud alignment provides maximum acceleration and quick turns. This was definitely evident on the harder ground where finding your grip with rugby boots can be more than challenging. The even spread and shape of the studs also added to the comfort of the boot. Being lightweight and built for speed was at the forefront of the minds of the developers at adidas for the Crazyquick malice boots. They took two key elements that are important to backs at all levels and this is what makes the technology in the adidas Crazyquick malice boots second to none. The Speed Elite soft synthetic leather upper and flexible forefoot make for a truly comfortable pair of boots. They’ve got that snug feel all the way around the foot, so if fitted properly they’ll feel like gloves from the first wear.The technical specifications suggest that the Speed Elite boots are best suited to narrow feet. I don’t necessarily disagree, but I feel there’s some flexibility here. Nobody in their right mind would classify my feet as being narrow yet I still found them comfortable. I’d suggest they’d be more than comfortable for a narrow to medium foot width. The only drawback for me is again related to the 6-stud sole. On the areas of the training pitch that weren’t particularly soft, I may have been heard mumbling something about “walking on stilts”. On the softer areas of the pitch, the tags seemed to be in their element however my personal preference is a more even weight distribution across the sole. I have to say that for a first time out in the boots, they were very comfortable. The training sessions involved a lot of speed work, changing direction and backline moves that would mimic a game situation. The Crazyquick passed the test with ease.The lightweight feel of the boots made them easy to get about in – it almost felt like I was running in a pair of trainers rather than rugby boots. The moulded design and the soft synthetic upper material felt like a second skin and did not rub at all. Also, being on hard ground, these boots really came into their own when compared to my Australian counterpart. I felt that the spread of the studs, compared to the traditional 6-stud design, helped distribute my weight better which made them much more comfortable. The one small criticism I have is that the sole of the boot was rock solid. While this gave me good stability, it was quite unforgiving on my feet at times. I do feel however that this would improve after a couple more hard sessions in them. Here we go again with the 6-studs. Although historically I’ve avoided this style of sole (and screw-ins altogether), I liked the control the Speed Elite gave me as I changed direction at training. The 6-studded sole with deep, specially spaced screw-ins are designed for superior traction on soft pitches.This was particularly evident when the coach had the squad perform a fitness exercise that involved a lot of back and forth running. Having played my fair share of rugby league, I know the importance of generating speed off the defensive line. As I approached the try line in this training drill, readying myself to turn around and burst off the line, I knew these boots were going to allow me to do this (and they did!). When given the opportunity to test the traction of the Speed Elite on a wet track, they really excelled. The studs grabbed hold of the wet pitch and significantly aided the control of my movement. It goes without saying that traction is vitally important in a rugby boot. 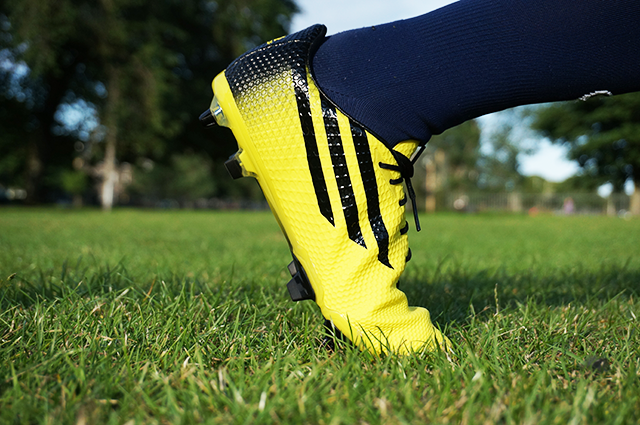 Not only is traction important for forwards in the scrum but also for backs to aid agility, acceleration off the mark and to be strong in the tackle.The Speed Traxion stud design on the adidas Crazyquick boots provided that traction in abundance. The spread and design of the studs gave optimum grip on the pitch and, even training at game speed on a hard pitch, I did not feel once like I was going to slip. The raised heel also really seemed to make a difference – I felt more readily prepared to sprint as I was further forward on my toes. I must admit, before testing these boots and reading up on some of the their in-built technology, I was slightly pessimistic about their potential but it was surprising what a difference they made. It was a shame we couldn’t test the grip of the boots in wet weather as it was a rare sunny day in Scotland. I can confidently say that the grip of these boots could easily cope with the majority of weather conditions you are likely to face. 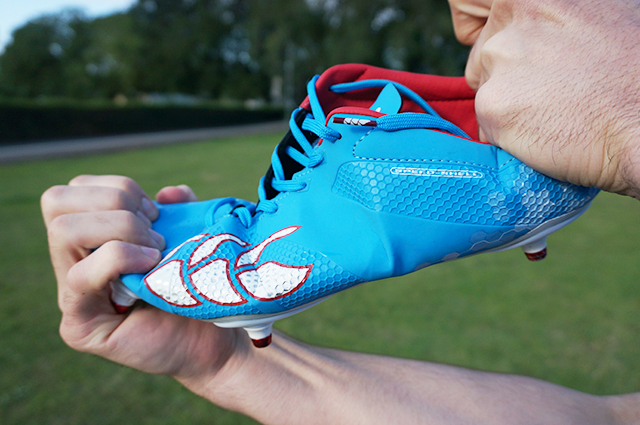 In my opinion, speed is one of the most important characteristics to assess when judging rugby boots for backs. Taking the field with boots on that you know can help you get around your opposite man gives an outside back great confidence.The Speed Elite offer an incredibly quick pick up due to their lightweight materials. 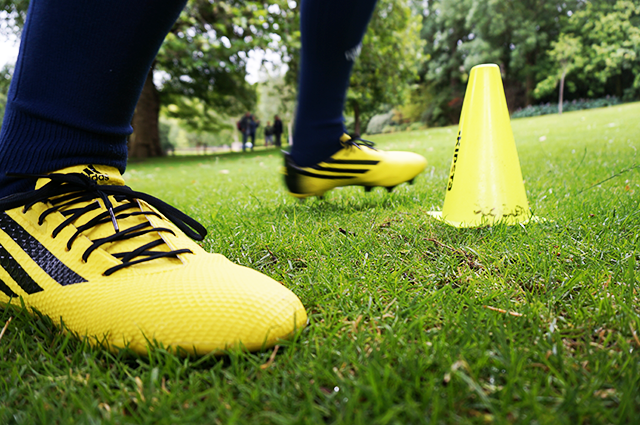 Combine this with their superior soft ground traction and you’ve got yourself one hell of a set of agile boots. Given that they are tailored to the needs of centres and wingers, you’d expect nothing less than a quick pair of boots and Canterbury have definitely delivered in this regard. Again, the adidas Crazyquick did exactly what they say on the tin. The Speed Traxion stud alignment really helped with my acceleration from a standing start, reaction times and ability to sidestep.adidas claim that the ‘sprint sole’ is 50% lighter than on other boots and I have to say you can notice the difference. 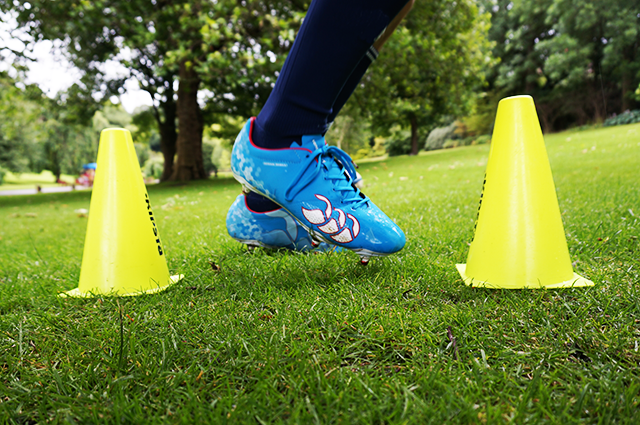 Agility and speed is what these boots are designed for and they really delivered in these aspects. Again, there was evidence the raised heel was helping to provide less stress on my lower limbs. My calves felt relatively unaffected while some of the other boys were moaning after a long running session. Normally, I think I would be in the same boat but the Crazyquick seemed to really make a difference. Being specifically designed for outside backs, you’d expect the Canterbury Speed Elite to be designed with kicking in mind. In comparison to the Crazyquick Malices, they are quite conical through the forefoot to the toe. The Speed Elite don’t have the tapered kicking surface area of their rivals in this instance either. Despite this strictly superficial assessment, I still felt reasonable control off the boot when kicking. Furthermore, they’ve got a sufficiently cushioned upper so you can spend hours perfecting your kicking at practice without any associated discomfort. We all enjoy the relief of having a solid excuse for shanking a kick, but I don’t think these boots would have such a negative impact. I feel that the truly experienced clearance kickers may notice the effects of the conical shape of the boots more than me. Despite this slight criticism, they have no trouble earning a pass mark for this criteria. 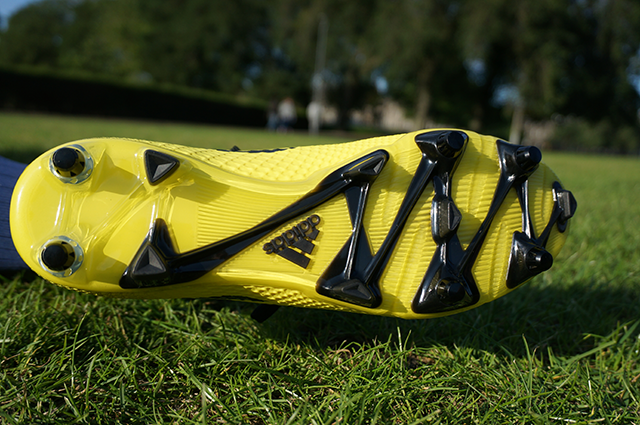 The Crazyquick boots are designed with the tongue of the boots twisted to the side to allow for more room for the ball. This made it feel as though I had more control when kicking out of the hand. They almost felt closer to a football boot in this aspect, especially when trying to get spin on the ball. 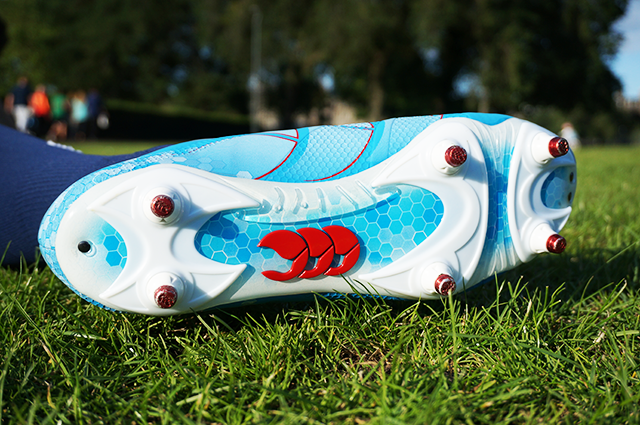 Unlike the Canterbury Speed Elite, the Crazyquick have a textured upper which provides additional grip. I feel this could definitely come in handy when trying to get a decent kick away in harsher weather conditions.One of the benefits of these boots is the skin like synthetic upper. This does provide comfort but due to it’s barefoot feel, practicing your kicks endlessly during training probably wouldn’t be as comfortable as their rivals in this review. You’ll definitely stand out from the crowd in the Speed Elite. The glossy powder blue contrasted against red trimmings makes for a striking appearance. 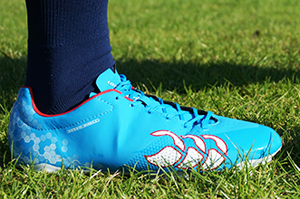 The large white Canterbury logo coupled with the watermarked hexagonal print on the heel contribute towards quite a unique looking pair of boots. You might get a few strange looks from the forwards but they shouldn’t attract too much heckle. 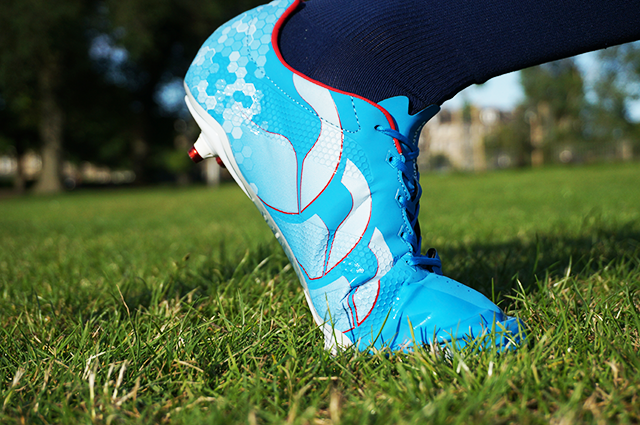 The Crazyquick really are a good looking pair of boots. 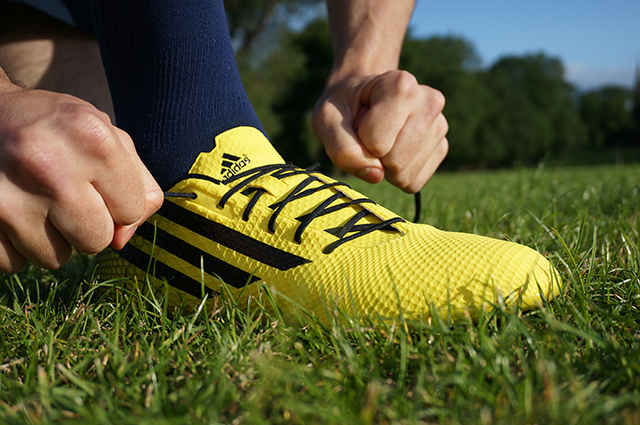 The bold, energetic yellow remains grounded against a black heel, trimmings and the distinctive adidas stripes. They’ve managed to pull off a very clean, focused design while still possessing that excitement factor. Their appearance nearly makes you almost feel more energetic by just wearing them. The Canterbury Speed Elite felt supple and flexible from the moment I laced them up. Because of this, I could tell that the break-in process was going to be an absolute breeze. As I took to the training paddock, I was surprised to note a lack of the typical new boot rigidity that I’ve grown accustomed to. If you’ve broken in new rugby boots in the past (which I assume the great majority of you have), you’ll know that mild blistering can be a part of the process. I did experience a couple of small blisters after my first heavy training session in the boots, but I feel they were exaggerated due to inconsistencies in the pitch’s firmness. I’ve not owned a pair of boots where I have walked away from the first session without blisters, so I’ll avoid being overly critical here. Expect the Speed Elite to be fully broken in after 2 solid training sessions. 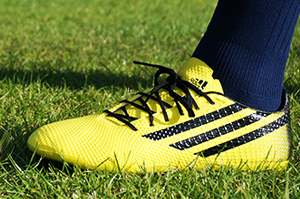 Blisters, rubbing, support – these are all key components a player will consider to assess the standard of a new boot. They are all part of the process of breaking in new boots. However, the severity, or lack there of can leave a significant imprint on whether to buy the same brand again.I found that breaking in the adidas Crazyquick boots overall was great. I had no blisters after a couple of preseason sessions. I did note a slight rubbing in my left foot but this was nothing to really complain about compared to some of my previous boots. The boots really did feel like a second skin for the whole session. They were flexible and had a lot of give which, from the pictures, you can see we tested.I think this shows how forgiving they are even with their barefoot feel. I doubt these boots would provide you any problems whatsoever after a couple of sessions in them. So, the Crazyquick have come out on top by a narrow margin over the Speed Elite according to the reviewers. 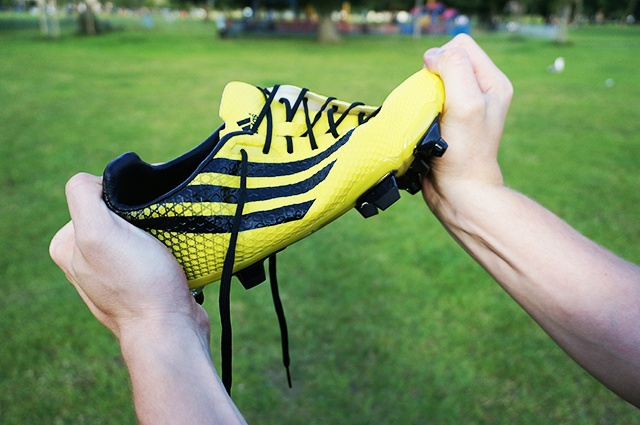 There were no criteria however where the Speed Elite lost serious ground to the Crazyquick which reinforces their standing as a seriously solid pair of rugby boots. With a number of rugby competitions gearing up for their season openers in the coming weeks, you’ve still got time to test them out for yourselves and compare your thoughts with those of the reviewers. We’d be very interested to hear your opinions, especially if you’ve already had the pleasure of trying either of these boots out. 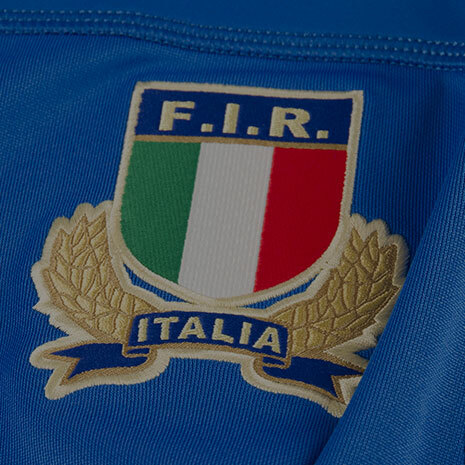 Good luck for the upcoming season!